EnCo SOX is a modular, multi user Safety & Security Engineering Workbench with comprehensive Integrations to your current IT landscape. 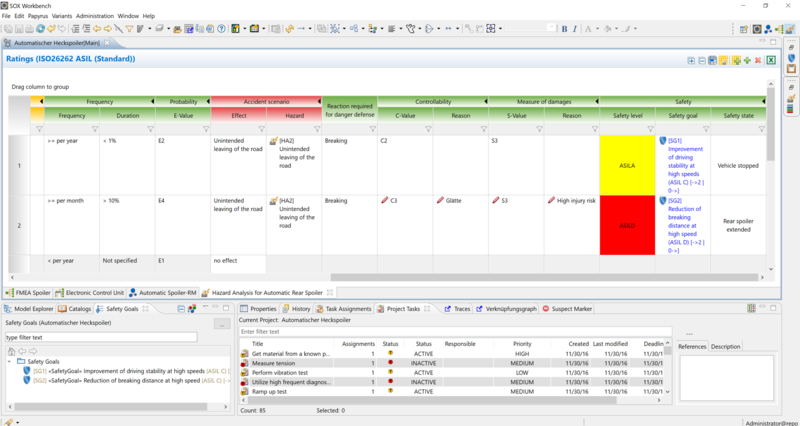 The SOX Requirement module offers a complete solution for elicitation, tracking and analyzing requirements. 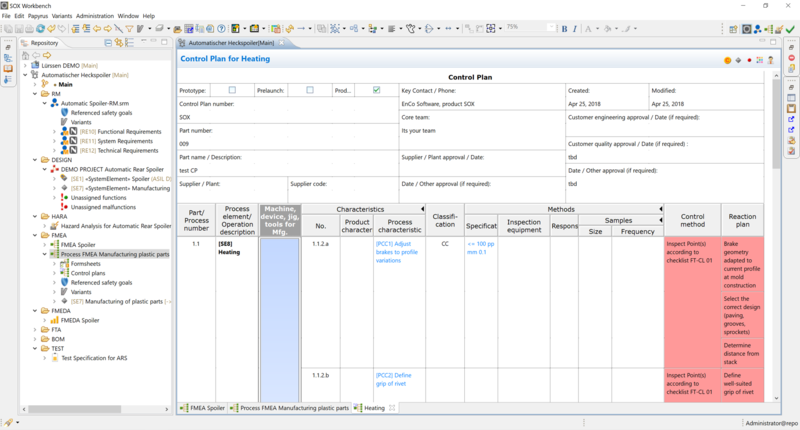 Import your product requirements specifications from Excel, Word, ReqIF or Rif and create the functional specification document in SOX. For this, you can reuse data former projects from the server-based catalog, compare different concepts and make status alignments via the SOX Traceability Matrix. The SOX Documents module supports you in creating individual configurable documents for creating your safety case with one click. 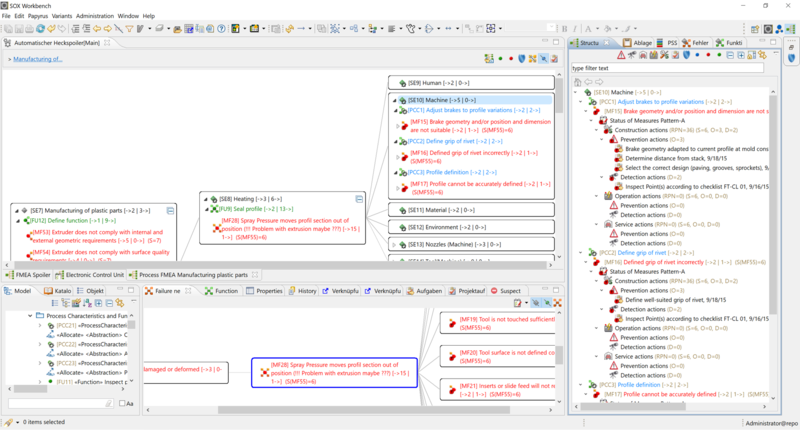 Create test cases based on your requirements in SOX and pass them to their specific testing tools. Please approach us for specific data outputs. We will adjust the output in XML so you can pass SOX test cases along to your test tools and read back the status, so as to generate maximum assistance in the preparation of your project-related traceability. Import or create your Bills of Materials (BOMs) in the SOX Reliability module. 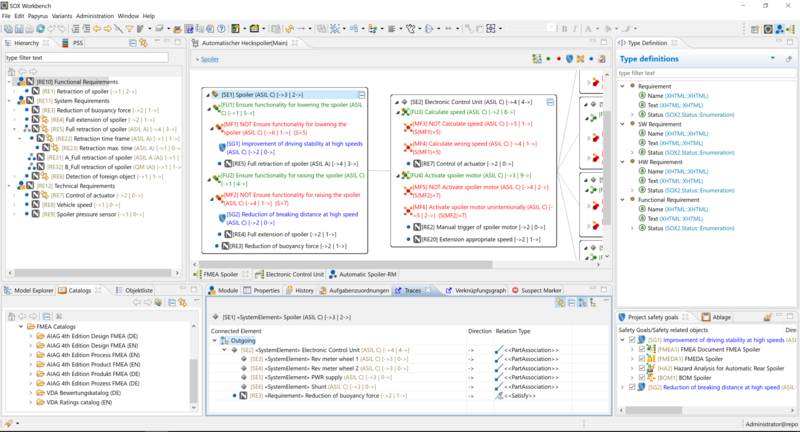 FIT values are calculated in the SOX RE module in compliance with project-specific profiles and can be used for various analyzes. SOX also enables the semiquantitative analysis from semiconductors down to their parts (DIE and Package) and sub-areas (Blocks), according to ISO26262 (part 11) and ISO PAS 19451. Calculate your parallel or serial configuration in the SOX module RBD whereas the various blocks are representing the individual system blocks. The SOX module RBD / FTA provides the option of displaying variants. Sources and effects of risks are therefore systematically identified and appropriate countermeasures (e.g. diagnoses) eliminated. Calculate system transitions in the SOX module Markov and obtain this data from the module reliability and the FTA. Besides the option of displaying variants the SOX module Markov / FTA provides the possibility of taking over hardware and system effects of the FMEA or failure modes from the FMEDA and to link them simply by drag & drop. Sources and effects of risks are therefore systematically identified and eliminated with appropriate countermeasures (e.g. diagnoses). 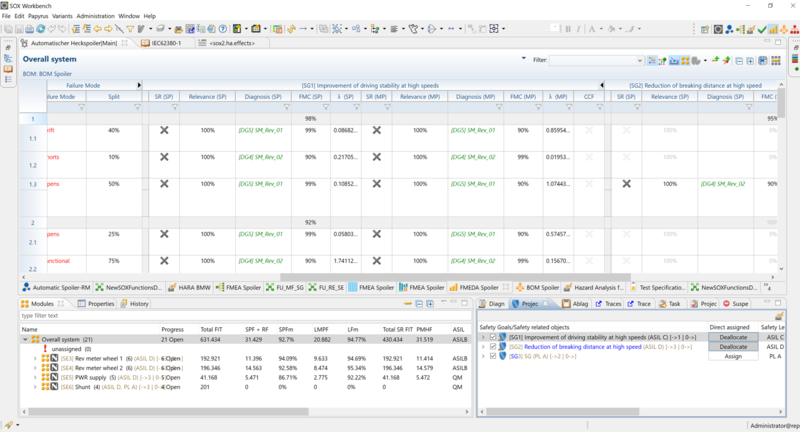 Calculate required probabilities in the SOX module FTA and track the progress of your analysis with the possibility to consign a status and to assign tasks. As an FTA software, the SOX module FTA provides the possibility, besides the option to display variants, to take over hardware and system effects of the FMEA or failure modes from the FMEDA and to link them simply by drag & drop. Sources and effects of risks are therefore systematically identified and eliminated with appropriate countermeasures (e.g. diagnoses). 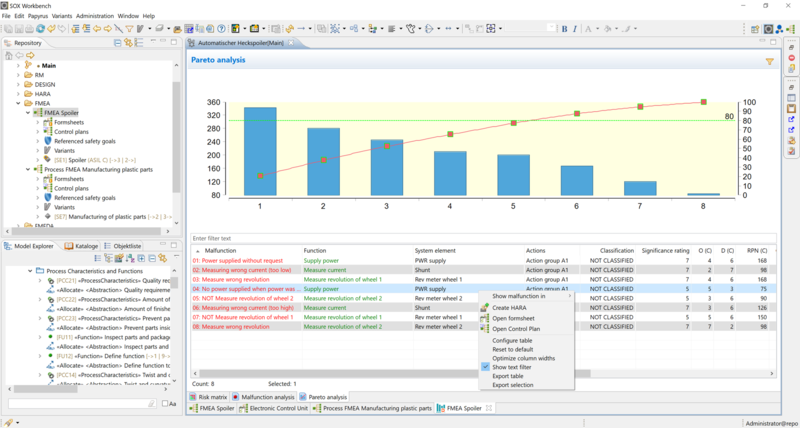 Quantitative analysis ISO 26262 (part 11) and ISO PAS 19451. The SOX FMEDA supports you in creating FMEDAs for industry-specific safety standards (e.g. ISO 26262, IEC 61508). Calculate your safety target specific metrics for each module and the overall system in the SOX module FMEDA and track the progress of your analysis with the possibility to consign a status and to assign tasks. SOX also enables the quantitative analysis from semiconductors down to their parts (DIE and Package) and sub-areas (Blocks), according to ISO 26262 (part 11) and ISO PAS 19451. 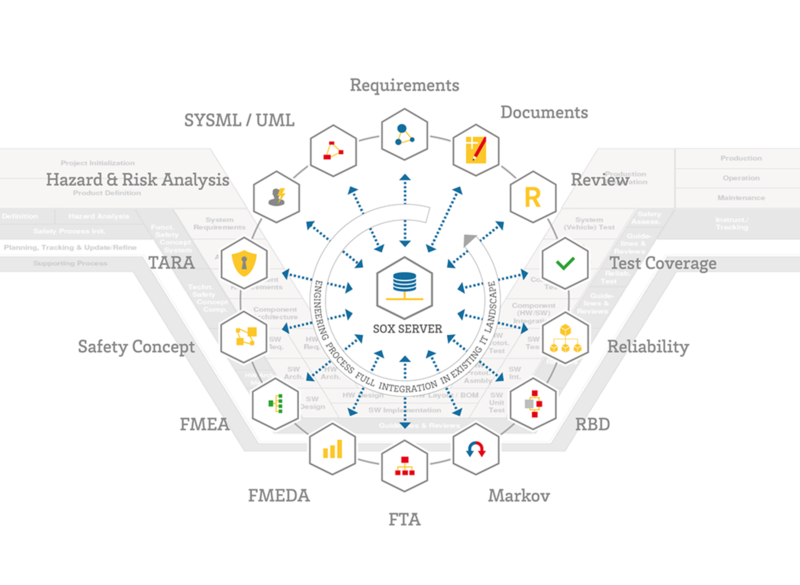 The SOX FMEA supports in risk analysis according to VDA 6 & AIAG. One of the many unique selling points is to analyze electronic components professionally. 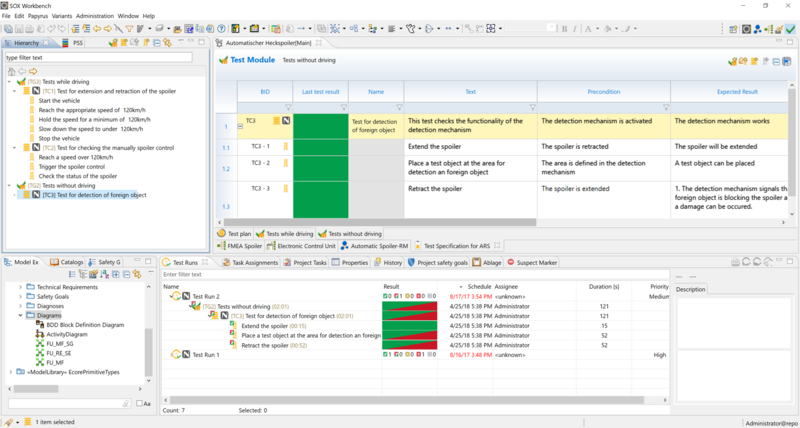 Besides the option to display variants the SOX module FMEA provides the possibility to define your own error nets and measures, depending on the system status (development, operation, service). Sources and effects of risks are therefore systematically identified and eliminated with appropriate countermeasures (for example, diagnoses). 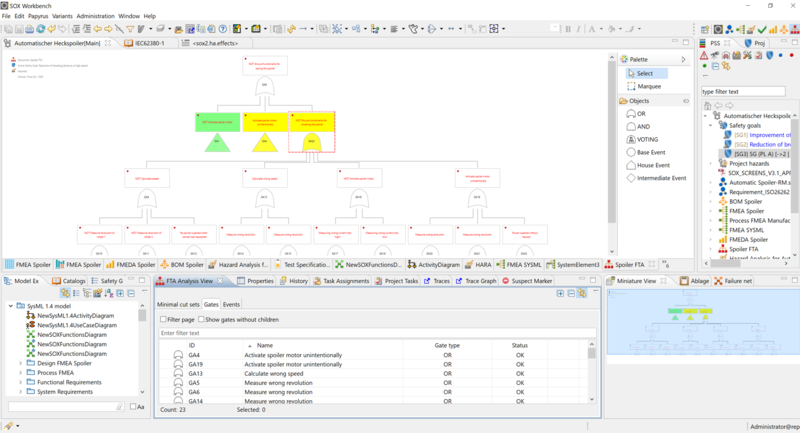 SOX Concept Designer is available as an extension of the system designer and can be used in the SOX Workbench. You can find out the special added value through the extension of the concept designer, which offers the possibility of taking into account various safety standards, such as ISO 26262 or IEC 61508 to model industry-specific security concepts (functional / technical security concept). The SOX TARA allows the allocation, management and evaluation of assets, effects, threats, operating conditions and security attributes. 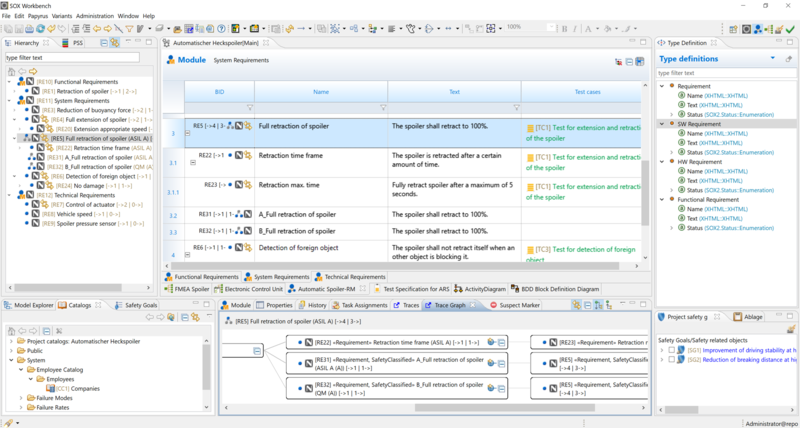 The evaluation matrix facilitates the individual assembly of different security level reviews. Selected aspects can be filtered, sorted and viewed in a variety of configurations. The SOX module hazard and risk analysis (HARA) elicit your security needs and assemble various safety reviews (SIL, ASIL, PL, etc.). 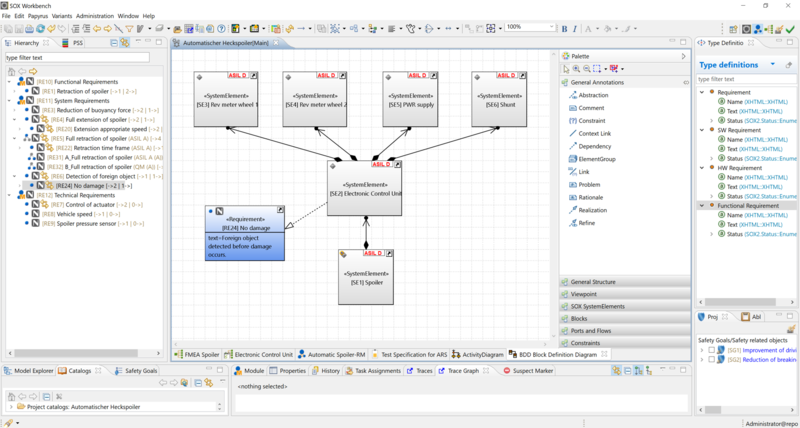 The SOX module system designer represents a comprehensive solution for modeling your specific system using the OMG SysML 1.4 and UML 2.0 standards. 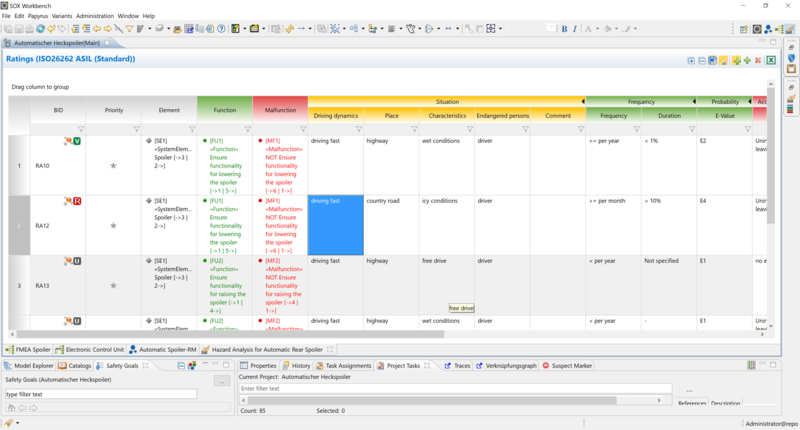 Define your system using a variety of chart types and link it based on specific requirements which can be passed into the SOX module Requirements. SOX RM for independent substitude in REQ Management and/or as interface module to IBM Doors, PTC, Polarion, etc.